I know that you shouldn’t judge a coffee by the package any more than you should judge a book by it’s cover, but sometimes you just can’t help yourself. 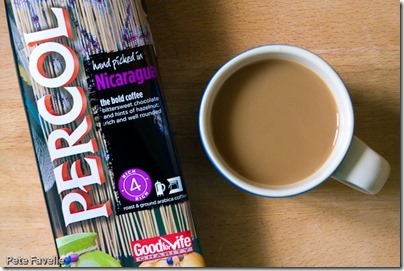 Percol is an example of this; it’s a widely available coffee brand that you can find in just about any supermarket. It’s reasonably priced. It’s all Fair Trade, and they give to charity. And yet, I’ve never tried them because their packaging just looks… cheap. Or rather, it looks like a cheap product trying to look more than it is. I don’t even know what it is about them that makes me think this way; it’s just an irrational gut feeling that coffee that looks like that is going to be about as tasty as something out of a Klix vending machine. So, time to get over my prejudice and see how it actually tastes. 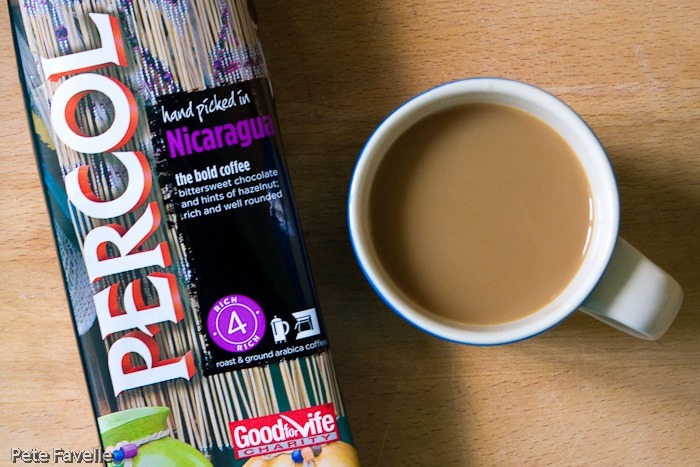 Percol’s Nicaragua is a strength 4 coffee from the coffee-growing heart of South America. The grounds have a deeply roasted aroma, with slightly singed roasted chestnuts and a touch of soft brown sugar. Brewed, there’s more of that faintly burned wood aroma long with a softer, nutella-like character. In the mouth, it’s far less bitter than the mildly over-roasted aroma let me to fear; it’s medium bodied, with a milk chocolate-like, slightly creamy nature. The sweetness is understated and balances beautifully with the gentle bitterness towards the finish. More refined than the aroma (and the packet!) initially suggests, it’s a very pleasant coffee – rich without being powerful, and far better than my prejudices led me to assume; 3.5 stars.